Spring Cleaning – I was reminded by a text yesterday about the need for Spring Cleaning. Yes, it’s springtime and spring is a time in of renewal, rebirth, revitalizing. Spring Cleaning is almost a ritual at this time of year – as we often need to look at the things around us and think, “Do they still work in our gardens, our homes, and in our lives. The Spring is a great time to review our goals and if you made them, New Year’s Resolutions. If you made New Year’s Resolutions, most people have forgotten them already, or have given up on them by now. If you set goals for the first quarter, where are you? Are you almost complete? Are you still tracking them with your action plan? Maybe it’s spring cleaning time in your life. Look at your life. What parts of your life, your garden of ideas and dreams, need some weeding? What closet in your mental house – your passions, need cleaning out? If you have plants, products, “Stuff” that doesn’t make you better, move you forward, make you happy – maybe it’s time to remove that from your place? As the person texting reminded me yesterday. Celebrate the spring. It’s nature’s way of starting over and seeing the brightness and beauty it brings. I’m grateful for my life and my ability to grow. Sometimes growth requires change. Cleaning out our closets and our minds helps to provide room for that growth. Take time this month to review what makes you happy, what makes you grow and what doesn’t. Let go of that which holds you back. Grow! Have a Great Spring, my friends. Go out and make today a great day. Do have some cleaning to do? Do you need someone to help you review what you want to do with your life, where you want to be? Maybe you need someone to hold you accountable. I know I could have used that type of person as I started working on my Spring Cleaning. I offer coaching services for people that want to gain an advantage over the clutter of life and help you set your goals and keep you accountable as you strive to achieve those goals. Check out my Coaching Page at Goal Getting Podcast.com / Services to find a plan that works for you and let’s start cleaning out the limiting beliefs and things that are holding you back from the beauty your garden can bring. 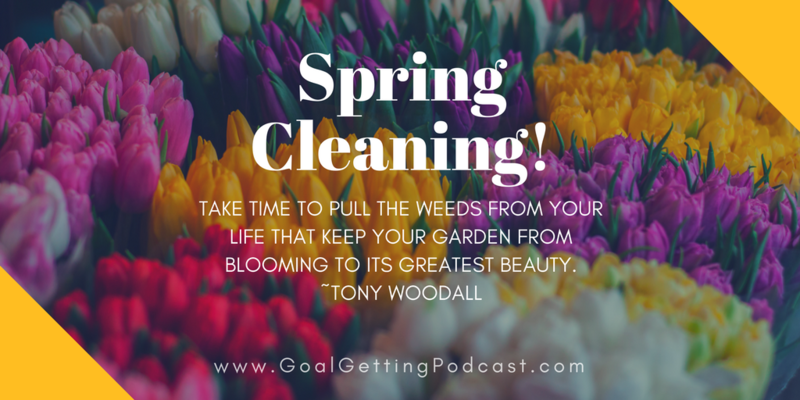 Leave a comment in the Comments section of our Podcast page at GoalGettingPodcast.com / Spring Cleaning. Let us know what is holding you back and how we can help you start to bloom.